How to remove "Your message has been entered successfully" page? Works for posts, but not for topics. Can I have for topics as well? What forum version are you using ? Just so we're clear, you're talking of the message after creating a topic ? I made a test on phpbb2 and it went straight to the new topic. Now neither of the codes doesn't work for some reason. 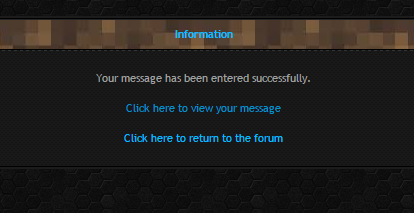 Your message has been entered successfully. Then click in [Submit] button! That script is quite unstable. Some times works, some times doesn't. I'd say works 50% of the times.